CJ7s are quite popular in Pakistan and can be spotted every now and than with a Jeep enthusiast however, no one I know is passionate enough to put a CJ 7’s body onto a 1984 Corvette. The owner built the car last year and has now put it up on Ebay for sale. 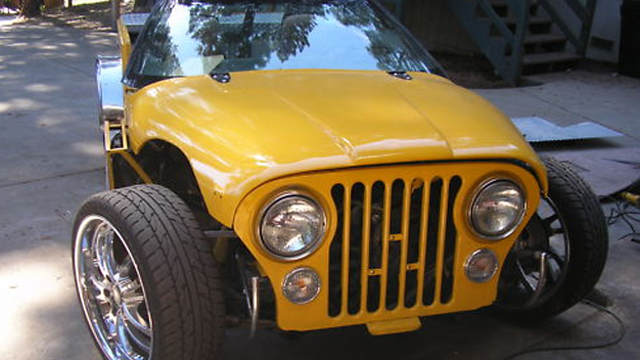 The body is of a 1977 Jeep CJ7 wrapped around a 1984 Corvette chassis however the engine is not an LS1 (Corvette’s original engine) but it a 5.3 liter V8 producing 275 BHP, from a Chevrolet Tahoe. Whenever a bloke or a company decides to remake a classic car, they usually spark fury from the enthusiasts or sometime, people end up in complete disarray after looking at such bonding. A Corvette and a CJ7 are both purpose built vehicles, one for off-road and the other a tire burning – ground-hugging sports car. The vehicle looks no less confused than our lollywood stars and just like them, it is in turn-key condition no matter how bad or out-of-shape it looks to you. And there are few problems as well in the car as it is a DIY project by the owner but the problems are mentioned at the Ebay page. The other problem is that I am now quite curious to know how much will this strange combination of distinct species attract.